So last week was pretty quiet. The Trucker was struck down with a tummy bug so I hardly saw him. I did have a very nice dinner at Doppio with @scottjorton, his soo-to-be baby-mamma, @clairam and @obitadicta. On Friday evening, The Trucker was back to better and we headed off to the Lyric for Trevor Noah's new show, That's Racist, with @clairam and @obitadicta. Loved it. He has yet to disappoint. I think he may currently be my favourite South African stand-up ... now that John Vlismas is becoming tedious and tiresome. On Saturday, The Trucker & I decided to have a rib braai at his house with some friends. Great success :) And so yummy. He made his truly delish Potato Salad with bacon and we all ate plenty. That afternoon The Trucker started LMS cricket again and I went to Wanderers to watch the Chennai Super Kings against the Sydney Sixers with @clairam, @samanthaperry and @obitadicta. All in all a good afternoon. Although 20-20 cricket is more boring than I remember - don't think I've been since I dated Bean! Maybe it's because it's these weird teams and I have no interest who wins or loses. The Trucker came over in the evening and we relaxed in front of the TV. 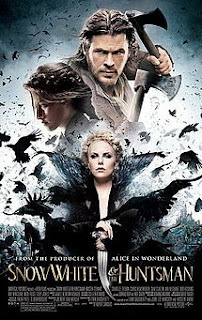 Huge error in judgement as we decided to watch Snow White and the Huntsman. I'd heard it was bad but I do like to make up my own mind. I'd never even have bothered, but The Trucker seemed keen to see what it was like. And so we watched. I could've given it up at any point and I did suggest it in the first 30minutes. Yawn. Seriously biggest waste of time ever and lost absolute appeal for me as soon as I realised it stared Bella :P Wow that girl can't act. And someone please tell me why they keep trying to remake the same old stories ?! Skip this. Seriously.